Developers are back at testing the waters after a relatively quiet first half of the year. While the first six months of 2018 saw developers launch 7,000 units in Dubai, this was a small number in comparison with the 19,975 homes launched in the corresponding period a year ago, according to data from Reidin. Danube Properties has launched its 11th project, titled Lawnz, in phase one of International City. The launch comes close on the heels of the developer reportedly selling out 95 per cent of its previous project, Jewelz in Arjan, launched in March 2018. The Dh550 million project in International City comprises 1,064 units spread across four buildings. 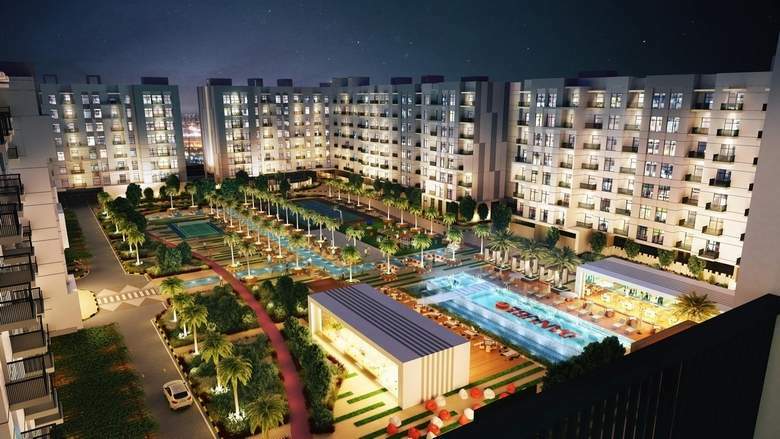 This project launch brings Danube Properties’ development portfolio to Dh3.7 billion. Lawnz will be the first gated community in International City and comprise 476 studios, 392 1-beds, 164 2-beds and 32 retail units. A studio is priced at Dh290,000, 1-bed costs Dh499,000 and 2-bed comes for Dh699,000. The average price per sqft at the project is Dh750. “We are able to deliver at this price because of our building material advantage and lower margins. The launch of such a large project at such a crucial time reflects our confidence in Dubai’s real estate market,” says Rizwan Sajan, founder chairman of Danube Group. The project is available at a 1 per cent per month payment wherein you pay 51 per cent until handover and 49 per cent after. For instance, for a studio, a buyer pays Dh150,000 until handover and the remaining can be paid with the rental income. A studio fetches Dh30,000 rental income in International City. “The area is favoured by investors since a property there can generate more than 8 per cent rental income annually,” observes Atif Rahman, director and partner of Danube Properties. The project will be spread across 1.29 million sqft, with 60 per cent land allotted for amenities. Some of the amenities include a 3.8-acre promenade, a canal, health club, swimming pool, steam and sauna room, jogging track, barbecue deck, badminton court, basketball court and an outdoor cinema. Construction will commence in Q3 2018 and Lawnz is slated for delivery in September 2020. “International City provides a good return on investment and the ticket price is so cheap. People residing in Sharjah who wish to live in Dubai can purchase in Lawnz. Our source markets are the UAE, Saudi Arabia, India and Oman. There is also huge demand from China for property in International City,” adds Sajan. The service fee at Lawnz will range from Dh12 to Dh14. Danube Properties has delivered 831 properties so far, including Glitz Residences 1, 2 and 3 and Dreamz townhouses in Al Furjan. It is slated to deliver a further 870 units later this year, including Glamz and Starz. “Factors that contribute to our sales success are our brand equity, unique payment plan, build quality and on-time delivery,” reckons Sajan. To a question on oversupply in the Dubai residential market, the founder chairman cites how the UAE’s population has grown by 5 per cent annually for the past few years. “Almost 200,000 people come to Dubai every year, of which at least 100,000 require apartments to live in. With four people living in an apartment on average, at least 25,000 new apartments are needed annually in Dubai. However, not more than 15,000 to 17,000 units have been delivered in Dubai in the past few years,” he adds. “There will never be an oversupply of good properties,” Rahman concludes.